One of the most common things you'll find at Lao festivals is this Lao snack food, called kow gum. Though technically, speaking kow gum specifically refers to the dark rice. Bamboo has wonderfully hollow inter-nodes that Lao people have used to cook food in. In this case, both regular white sticky rice and also dark rice with coconut milk and a bit of sugar. The bamboo is cut into portions. It's then cleaned and its outer layers stripped and smoother over giving it a thin profile. The ingredients are added to the bamboo and then cooked over an open flame. From there, vendors bring them to where ever there are festivals. Some vendors sell it straight up as is and others will warm it up for you over a flame. You might be wondering how you would eat it? Simple - think of a banana. 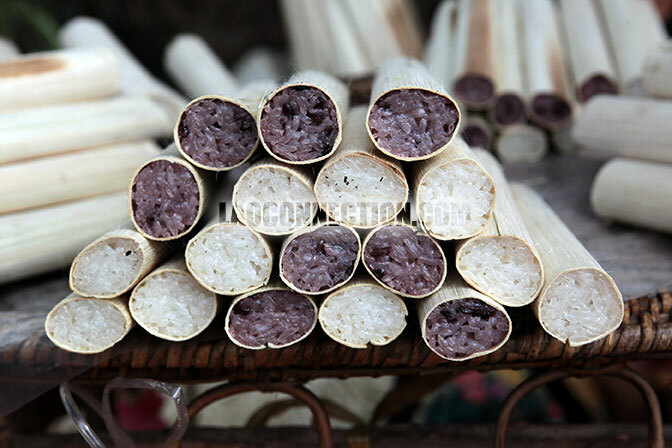 You peel back the bamboo in strips which exposes the sweet, soft sticky rice within. Enjoy.